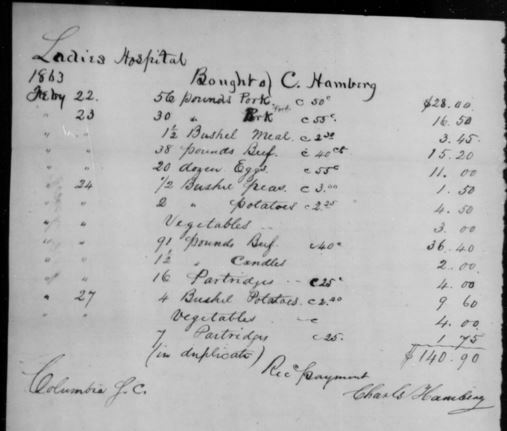 Last week I wrote about Samuel Hamberg, the twelve year old boy who appeared in the household of my great-great-uncle Henry Schoenthal in 1880 as his adopted son. 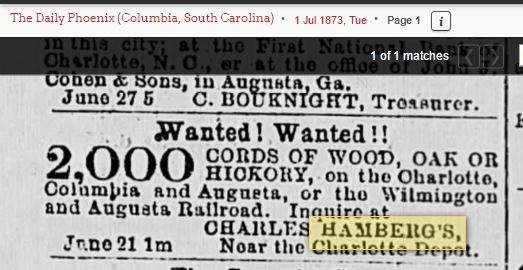 As I described in that post, I had determined that Samuel was the son of Charles Hamberg of Columbia, South Carolina; he appeared on the 1870 census living in Charles Hamberg’s household along with a woman named Tenah Hamberg and a servant also with the first name Tenah. 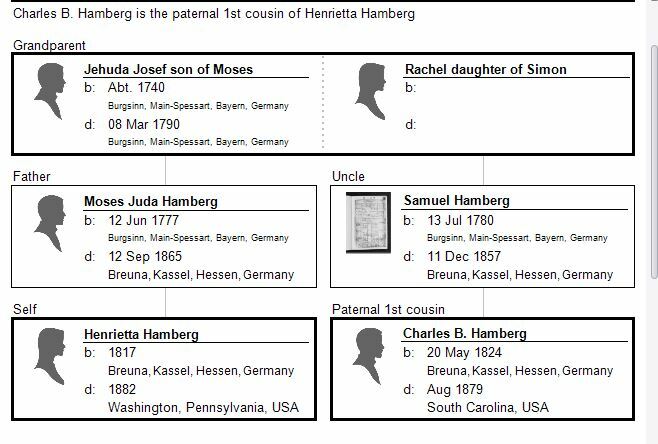 Through my research, I concluded that Charles Hamberg was in fact born Baruch Hamberg, the son of the first Samuel Hamberg, my great-great-grandmother Henriette Hamberg Schoenthal’s uncle, her father’s younger brother. 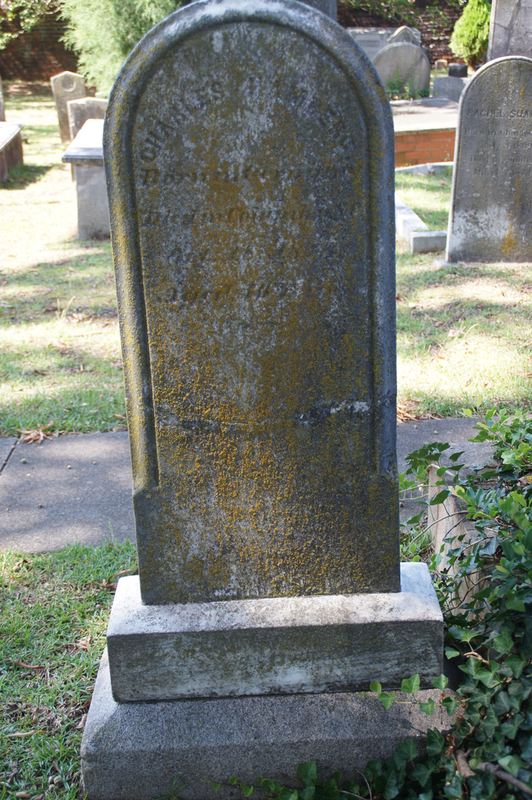 Baruch had left Breuna, Germany, in 1852, with his first cousin Abraham, who died in Savannah, George, in 1854. 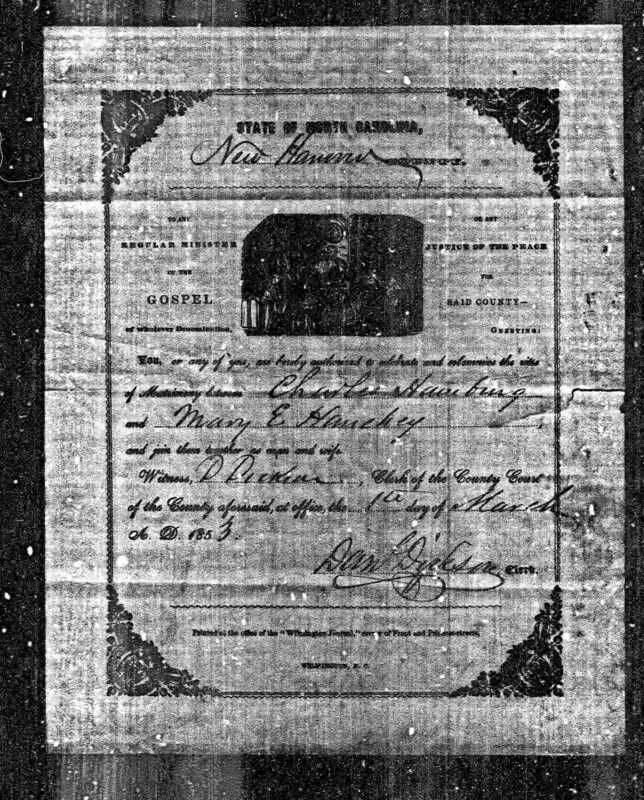 Baruch, I postulated, became Charles and had married a woman named Mary E. Hanchey in New Hanover, North Carolina, in March, 1853. But why did Samuel end up with my great-great-uncle Henry in Washington, Pennsylvania, in 1880? What had happened to his father? His mother? And who was his mother? Was it Mary Hanchey, the woman Charles married in 1853 and with whom he was living in 1860? Or was it “Tenah,” the woman he was living with in 1870? 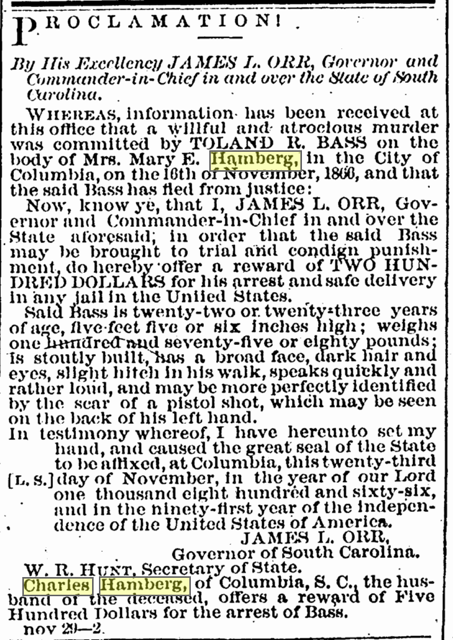 Record of Deaths in Columbia South Carolina page 80 [p.80] Mrs. Mary A. Hamberg , wife of Charles Hamberg died in Col’a So. Ca. Novr 18, 1866, having been shot [page 166] by a man, Toland A. Bass, a few days previous. Unfortunately, the database had no further information about this terrible incident, but I was determined to learn more about Mary’s death. Was it accidental? A murder? What happened to Toland Bass? Coroner’s Inquests.—On Friday last, a difficulty occurred between Toland R. Bass and C. Hamberg. The latter went into the house to get his pistol, but on coming out, was stopped by Mr. Jos. Burdell, when Mrs. H. took the pistol away from him and went to the door, holding the pistol in both hands, but not attempting to use it, and said to Mr. Bass, “Do not shoot Mr. H.; if you want to shoot any one, shoot me.” Bass attempted to take the pistol from her, but failed. 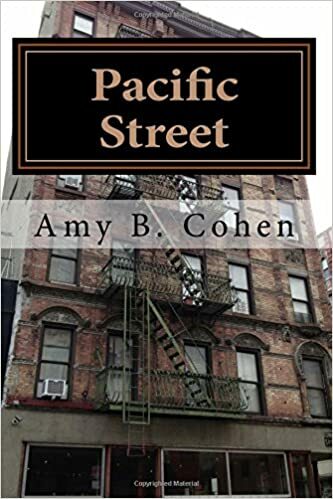 He then stepped several paces from her, presented his pistol three times and the fourth time fired, the ball taking effect in the abdomen of the unfortunate woman. She called to a friend near by to take care of her, as she was shot and ready to faint. Mrs. H. was taken into the house apparently suffering greatly. Dr. Talley was called in and rendered all possible medical assistance. She lingered until Sunday afternoon, when she expired. 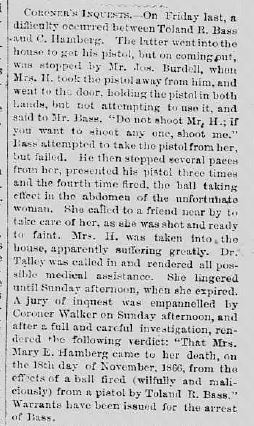 A jury of inquest was empannelled by Coroner Walker on Sunday afternoon, and after a full and careful investigation, rendered the following verdict: “That Mrs. Mary E. Hamberg came to her death, on the 18th of November, 1866, from the effects of a ball fired (willfully and maliciously) from a pistol by Toland R. Bass.” Warrants have been issued for the arrest of Bass. 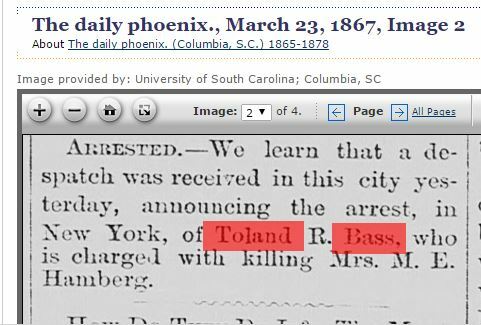 Who was Toland Bass, and why did he kill Mary Hanchey Hamberg? Why did Mary suggest that he should shoot her, not her husband? The only thing I could find about Mr. Bass was that he served as a private in the Confederate Army during the Civil War in Company H of the South Carolina Cavalry Regiment. On February 17, 1865, Columbia surrendered to Sherman, and Wade Hampton’s Confederate cavalry retreated from the city. Union forces were overwhelmed by throngs of liberated Federal prisoners and emancipated slaves. Many soldiers took advantage of ample supplies of liquor in the city and began to drink. Fires began in the city, and high winds spread the flames across a wide area. Most of the central city was destroyed, and municipal fire companies found it difficult to operate in conjunction with the invading army, many of whom were also fighting the fire. The burning of Columbia has engendered controversy ever since, with some claiming the fires were accidental, a deliberate act of vengeance, or perhaps set by retreating Confederate soldiers who lit cotton bales while leaving town. On that same day, the Confederates evacuated Charleston. On February 18, Sherman’s forces destroyed virtually anything of military value in Columbia, including railroad depots, warehouses, arsenals, and machine shops. You can read more about the Columbia fires here and here. In the aftermath of the war and during Reconstruction, places like Columbia struggled to rebuild their economy and their infrastructure. There was widespread poverty. 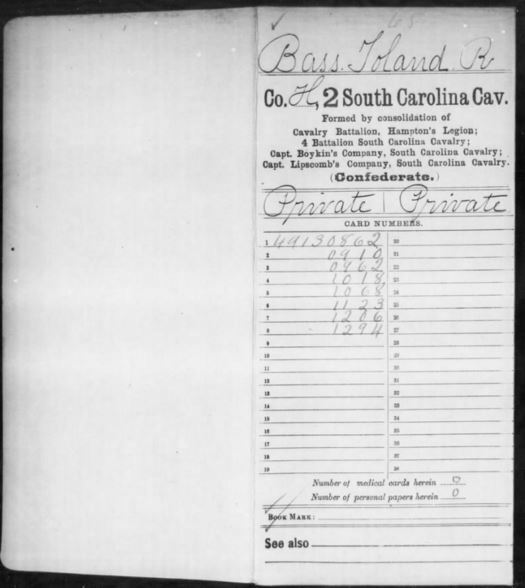 Perhaps Toland Bass was an embittered Southern veteran; perhaps he resented Charles Hamberg as a merchant who not only didn’t serve in the war but made money during it. Or maybe it is something much more personal that created the animosity that led to the gruesome murder of Mary Hanchey Hamberg. I don’t know. Bass eluded arrest for four months until he was finally found and arrested in New York in March, 1867. 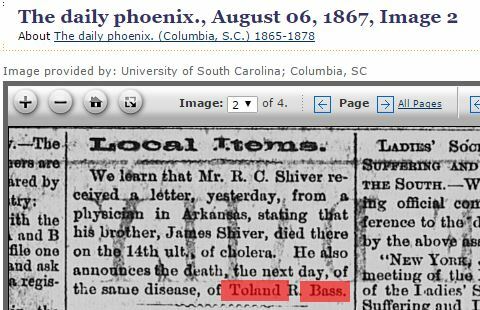 I could not find any record of a trial or any other proceeding involving Bass, but I did find this news item announcing his death from cholera on July 15, 1867. 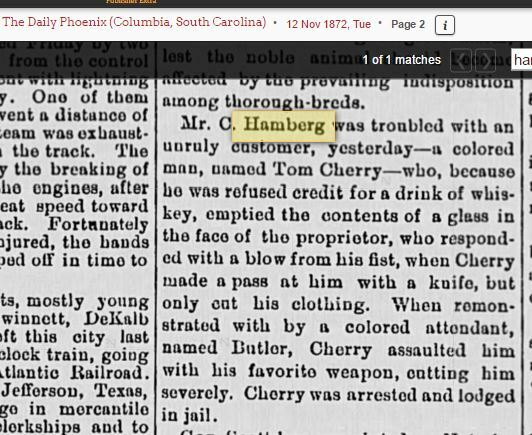 Meanwhile, Charles Hamberg had moved on. Thanks to my blogging friend Cathy Meder-Dempsey, I know that Charles married Lena Goodman on April 6, 1867, in Charleston, South Carolina. I believe that Lena was incorrectly entered as “Tenah” on the 1870 census and that she was the mother of Samuel Hamberg, the boy later adopted by Henry Schoenthal. Although I do not have an exact birthdate for Samuel, the 1900 census reported that he was born in February 1868, that is, about eleven months after the marriage of Charles Hamberg and Lena Goodman. Charles also charged a police officer with inappropriate conduct (public drunkenness) and engaged in a citizen’s arrest. He seemed to have a tendency to get involved in conflicts. In the 1870s, Charles advertised his wood and coal business regularly in the Columbia newspaper, The Daily Phoenix. So whatever his troubles, Charles seemed to be living a somewhat ordinary life in Columbia. 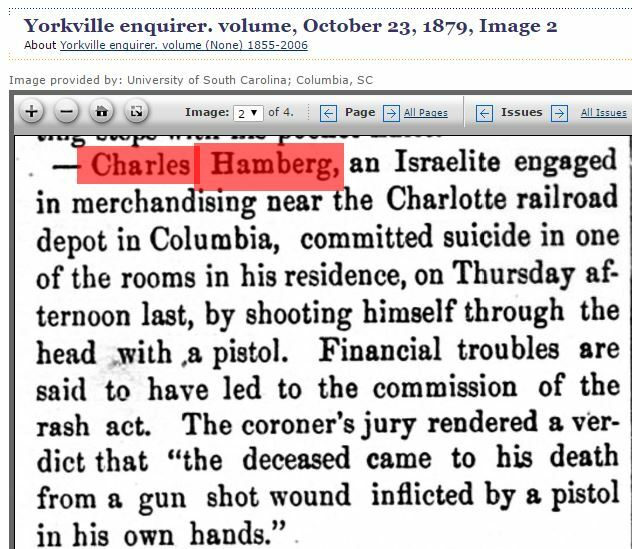 Two years later on October 16, 1879, Charles Hamberg ended his own life, apparently due to financial difficulties, although I would venture that having had one wife murdered and a second dying at a very young age might also have given him sufficient reason for some desperation. 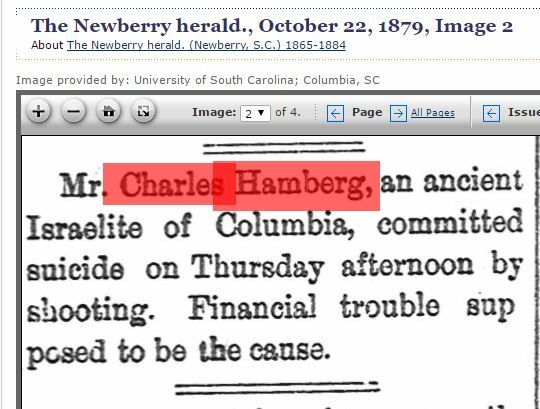 His suicide made the papers even beyond Columbia. Can you imagine today identifying someone by their religious background for no apparently relevant reason? 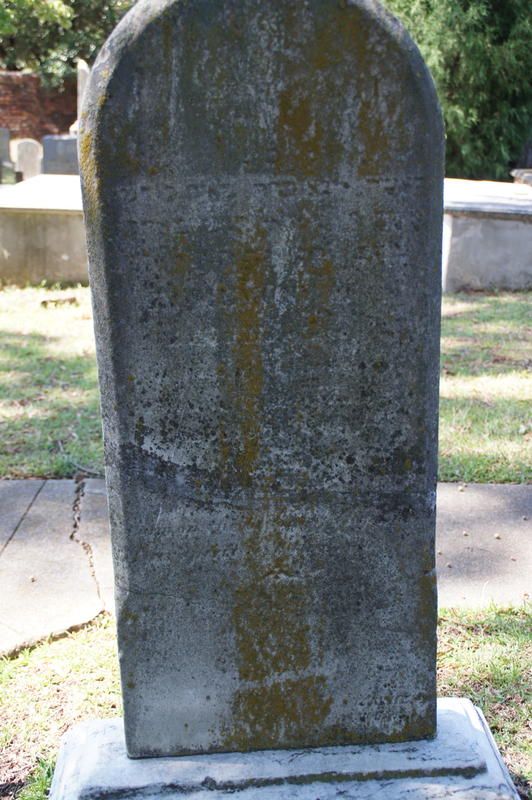 Charles is also buried in the Columbia Hebrew Benevolent Society cemetery, next to Lena. 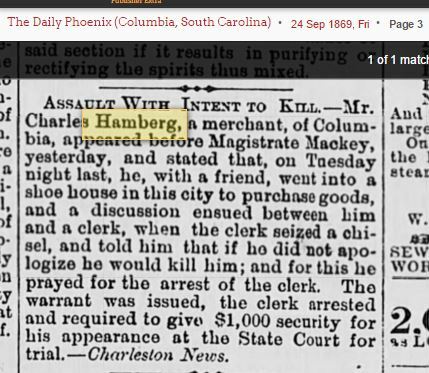 What a hard life Charles Hamberg had once coming to the US. He lost his cousin Abraham in 1854, his wife Mary was murdered in 1866, his second wife Lena died in 1877, and he suffered financial problems and took his own life in 1879. I imagine that that was not the life he dreamed of when he left Breuna, Germany, in 1852. For him the American dream did not come to be. His son Samuel was just eleven years old and had lost his mother and his father. He ended up in Pennsylvania with Henry Schoenthal, his second cousin. How did he end up there? That leads to the next mystery. This entry was posted in Breuna, Genealogy, Germany, Hambergs, Pennsylvania, Schoenthal, Washington PA and tagged American Civil War, Breuna, Columbia, Hamberg, South Carolina, suicide by Amy. Bookmark the permalink. I noted examples of knife violence and chisel violence in the blog also, why only reference “gun violence”? Ah, but no one was killed with a chisel or a knife, only a gun. If Toland Bass had attacked Mary with a knife, she likely would have survived. Wow, Amy. What a tragic tale you’ve uncovered. Fabulous research (as usual)! Thanks, Leslie! How are you?? Hope all is well. Such a complex story filled with violence. Samuel was fortunate to have any family at all it seems. Looking forward to the next chapter. Thank you, Janice! I am working on it right now. What a story! Poor Charles had a lot of heartbreak during his life. Yes, and it seems to have affected him dramatically. Charles’ is a sad story. I hope Samuel had a better life than his parents. Is that your next post? I am working on Samuel. Not an easy one. I look forward to reading what you learn! Amy, I didn’t expect this part to be full of suspense and tragedy. You’ve found so much information. I’m looking forward to the next “chapter.” Thank you for the mention! It was certainly not what I expected either! And you’re welcome, Cathy. Jeepers! You were able to gather a lot of information. I wish I knew what precipitated the shooting. So do I! So frustrating!